Ever feel like you’re standing on thin ice? Here at the northernmost point on Earth, no land lies below. Are there seasons? Who lives here? What does Santa look like and where does he live? Uncover the answers in Little Miss HISTORY Travels to The NORTH POLE, the newest release in the award-winning children’s nonfiction book series. Barbara Ann Mojica is a historian and retired educator. She writes historical articles for the Columbia Insider under the banner “Passages.” Barbara is a licensed New York State educator with forty years’ experience in Elementary Education, Special Education, and School Administration. 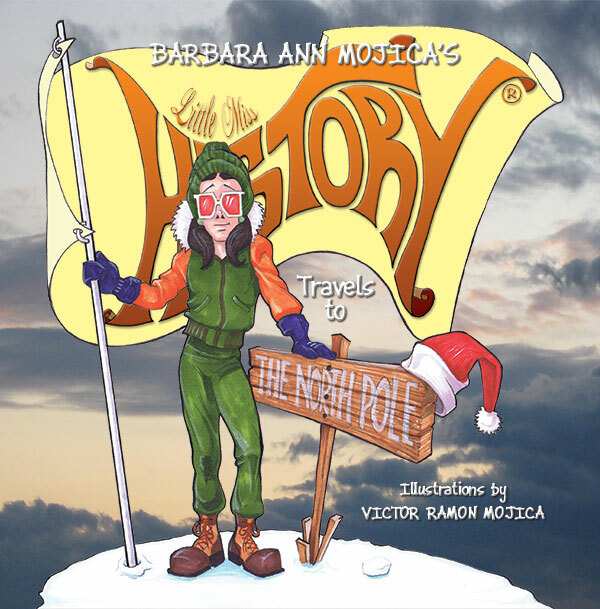 Using the whimsical Little Miss History character, Barbara hopes to inspire children to learn about historical people and places. Little Miss History’s antics make reading nonfiction a fun-filled adventure for all ages. Book Series Awards include International Reader’s Favorite Awards, International Book Excellence Awards, Independent Author Network Awards, Eric Hoffer Award, Global e-book award, CLIPPA Principal’s Award, and B.R.A.G. Medallions to name a few.